FILE - An Afghan National Army soldier takes a position at the Shindand airport in Herat province, about 370 miles west of Kabul, Afghanistan, Aug. 16, 2004. The Taliban attacked the ANA base in the Shindand district, officials confirmed Friday. The Taliban has killed at least 14 Afghan soldiers and taken more than 20 others hostage in the western Afghan province of Herat, which borders Iran, officials confirmed Friday. Separately, a counter-Taliban airstrike in central Uruzgan province killed at least seven Afghan security forces. Officials in Uruzgan explained the deadly airstrike had actually been called in to prevent insurgents from overrunning Chinartoo district center following an early morning Taliban offensive. The insurgent group's so-called Preaching and Guidance Commission in a statement Friday listed details of what it claimed were "unprecedented activities of the Islamic Emirate [the Taliban]" government that eradicated narcotics from the country and improved security, economic and social conditions of Afghans. 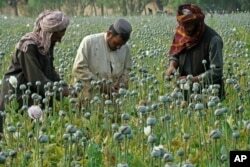 FILE -- Afghan farmers harvest opium in Helmand province, Afghanistan, in April 2014.